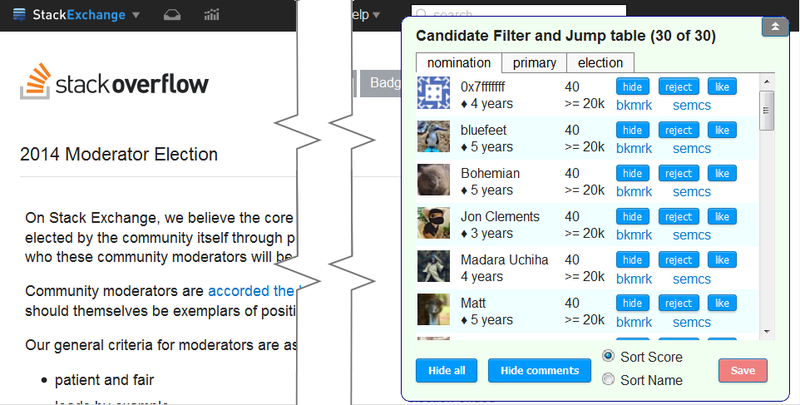 For moderator elections, this script greatly helps vet and compare candidates. Lists candidates in sorted order. Find him/her in a repeatable, predictable, location every page visit. Click on a jump-table row to instantly scroll to that candidate. Save a bookmark that opens the page to that candidate's entry, every time. Like, Hide, or Reject a candidate. Save your data between page visits and between tabs. If you open one of those SEMC links, the script automatically scrolls to the targeted user (even while the SEMC page loads and settles). If you downvoted a candidate in the primary, then those users are auto-rejected when you visit the primary page. Is on GitHub at BrockA/SE-Election-Assistant. To get to the election pages, add election/ to the site's home address. It shows a list of all elections that have been held for the site. Also, find a list of all site's last, or current, elections on the Stack Exchange Moderator Candidate Statistics main page (when/if it comes back online). Browse other questions tagged script greasemonkey tampermonkey elections .